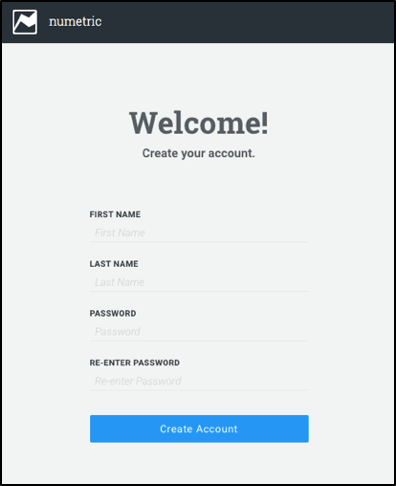 Learn how to login to Numetric, as well as a general overview of the Numetric platform. Welcome! Numetric helps you make better, more informed decisions for your organization, and we're excited for you to get started. This quick start guide will teach you the basics of how Numetric works. You may have already received a welcome email from the team at Numetric or someone else in your organization. If not, contact Numetric's support team by clicking on the chat bubble in the bottom right corner of this screen, and we'll get one out to you right away. When you've made the proper request, you'll receive an email inviting you to join your organization on Numetric. Simply follow the included link to accept the invitation. You'll be asked to provide your name and create a password, and then you're in. Now that you've created your account and logged in, it will be helpful to get to know the interface before you dive in. Here's a quick overview of the five sections of Numetric that you’ll need to know in order to be successful. Sources are how you get data into Numetric. We’ll talk more about these in more detail in the Sources article. Once your data is imported through Sources, it will show up as a Table. Tables are flat files, similar to spreadsheets with rows and columns of data, but without size limitations. For those of you SQL users, you can create SQL views to display as Tables within Numetric. The Tables section contains tools to help clean and prepare your data for future use. 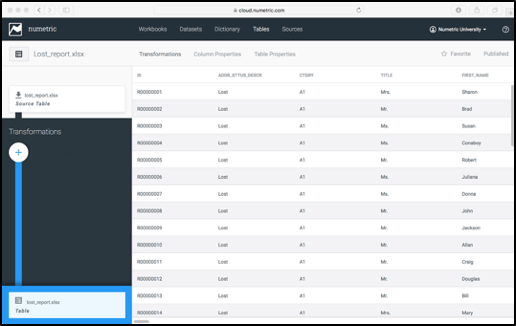 Numetric provides many easy-to-use tools to help filter, clean, and transform the data in your Tables, which is often one of the most time-consuming steps of working with data. With your Tables all cleaned up and ready to go, you can easily establish relationships between different Tables using the Dictionary. Our clean, easy to use interface will help you link data across various Tables, establishing complex relationships with just a few clicks. Datasets allow you to create custom groupings of data from various Tables, with a specific user group in mind. Maybe you want your sales team to be able to see selected information from Tables drawing information from accounting, shipping, and customer service Tables. Using a Dataset you can reference just the information you want your users to see without worrying about which Table it resides on, and then trim out the rest. Much like Tables, Datasets also allow for further cleaning and organizing of data. 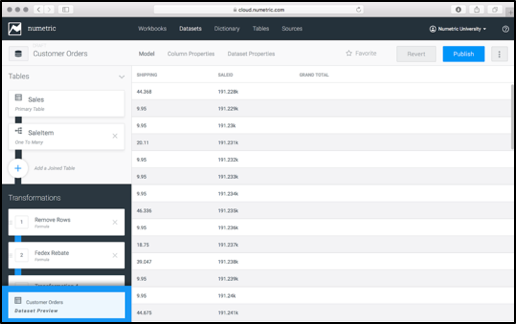 You can filter, clean, and transform your data here, using find and replace, if then statements, and custom formulas,making it exactly what the end user wants it to be without impacting any of your Tables. The data in Tables are stored on traditional servers - inexpensive, and slow. Because Datasets are where the magic happens, we save our prime real estate for them. 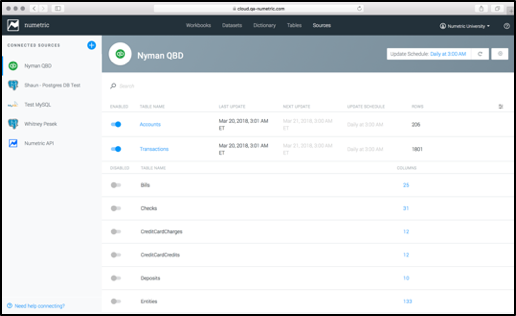 This “Lightning Storage”, as we call it, allows for lightning-quick reports for the end user. Now that your Dataset is all cleaned up and ready to go, it’s time to make sense of all this data. 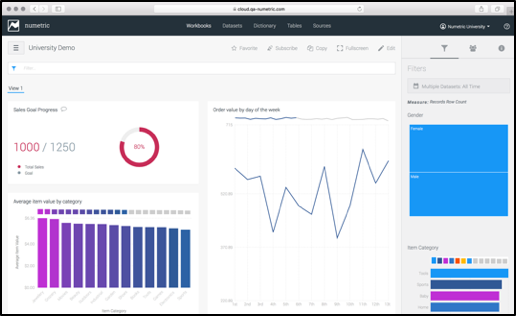 Workbooks are where you can create dashboards with your custom Metrics; simple to read, easy to understand visualizations of data. 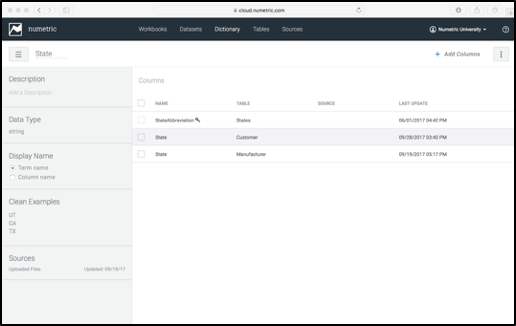 And because your Workbook draws from Datasets that are already cleaned, organized, and linked, virtually anyone can create a workbook not just ‘data people’. This not only makes the data more accessible to everyone, but it also reduces the burden on your data experts who no longer need to spend their time building reports for everyone in their organization. Our Workbook editor allows for you to easily display exactly what you want, from basic KPI’s and tables, to bar charts and line graphs, all with custom filters for the end users that update the displayed charts with lightning speed. Once your Workbook is all built out and displaying your data the way you want it, you can share it with the world! … or with a selected group of your closest colleagues, it’s up to you. Our Portal tool allows you to create either a private or public gateway to share these Workbooks with whomever you choose. As you can see, there is a logical flow from Sources, through Workbooks. You begin by importing your data, cleaning and organizing in Tables, building relationships across Tables through Dictionary, selecting what to analyze in your Dataset, and end with building and sharing the final Workbooks with your target audiences. The articles in this series will walk you through the specifics of each section of the Numetric platform, and help you create and share your first Workbook. If at any point you have questions, don’t hesitate to reach out. The click-to-chat icon, located in the bottom right corner of each page will put you in touch with one of our actual, real live people, who are here to help with whatever you need. You can also contact us from within Numetric itself, just click on the question mark icon in the top right corner of the window and select Chat with Support. Ready? Click below and we’ll walk you through how to get your data into Numetric.